Do you use curling irons or rods (also known as clipless curling irons) on your waves or curls? It seems sort of ironic, but these simple heat tools can be a great addition to your hair care routine. They can be helpful for dressy and casual looks, or simply just something a little different every so often. 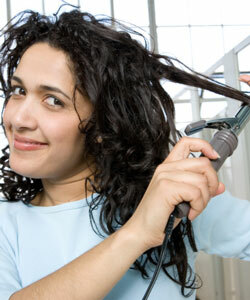 Curling irons and rods can help in enhancing natural curl patterns as well. Both curling rods and irons are available in a variety of options including titanium and tourmaline. Titanium is a favorite with stylists as they prove to be very durable, corrosion resistant and perform extremely well for all hair types. Tourmaline, sometimes blended with ceramic, allows a larger flow of negative ions, which results in extra shine and protection to the hair. Both are excellent technologies as they evenly distribute heat each time it is applied to the hair. In deciding what is right for you, first make up your mind about what you want from your tool? Do you need to just “fix” a few curls or ends here and there, or do you want a head full of tighter or looser curls? For the most part, if you have medium to longer curls or waves, you can easily use a curling rod. These tools have become more popular over just the past few years since they help make longer locks curlier, wavier or simply add more volume. Almost all curling rods and irons these days heat up quickly and have a variety of heat settings. Type 2 (Waves): Low to medium heat. The shorter your hair the more control over the tool you will need. Type 3 (Curls): Medium to high heat. Type 4 (Kinks): High heat. Using a curling rod can take some getting used to, but is easily learned. Simply start with dry hair and wrap it around the rod/barrel. The ends of your hair will wrap around last so there is less damage and fewer split ends with the rod. If you have thinner hair, the rod is also beneficial in that there is never any creasing or marks left behind as there is no “clamp.” If you’re looking for volume, the rods tend to be better at getting closer to the roots. Rods are available in a variety of sizes and usually are sold with heat proof gloves (to protect fingertips as you wrap). Curling irons offer excellent precision control and are great for beginners. The clamp maintains a firm hold on hair for easy styling. They are generally available in a great variety of sizes (usually from 3/8” to 2+”) and heat up quickly and easily. Join the CurlTalk convo: How do you use a curling iron?